A lovely hideaway nestled in the treetops of the quiet Big Hollow cove on grand lake of the Cherokees with a panoramic view of the water. The Anniversary Cottage sits on a hillside 400 feet from water access. The Anniversary Cottage is a 1 bedroom with a sleeping loft that will accommodate up to 6 people, but is perfect for a couple’s get-a-way. The Anniversary Cottage is a quiet, cozy, luxurious get-a-way to relax in with all the comforts of home. Will sleep 6. Whether you are an early-bird enjoying the early morning light over the water & the music of the morning birds or a night-owl taking pleasure in the sounds of the night & the moon reflecting on the lake, you will appreciate lounging on the covered deck soaking in all the sights, sounds and smells of nature. The bath would compete with any 5 star hotel, with thick thirsty towels. It has a jetted tub for two. If that isn't to your liking, the shower will accommodate two also. Lounge on the 16 x 36 swim platform watching the ducks play in front of you and seagulls dive or maybe catch a glimpse of the resident bald eagle. Our cove is a favorite spot for fisherman. We have a 16 x 36 swim platform as well as a dock available for tying up your boat that. You may fish off the dock or if you enjoy taking a dip, you can take a dive off the dock and float around for a leisurely afternoon in the water. 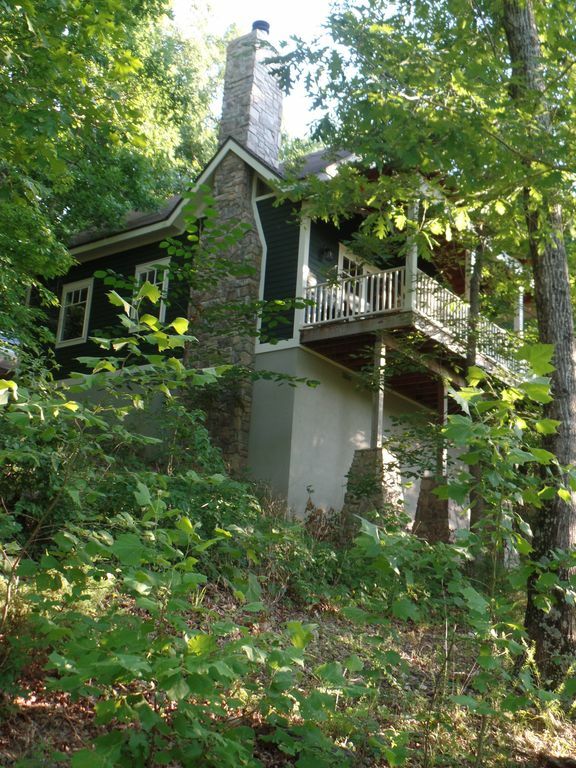 The Anniversary Cottage is located in Big Hollow Cove about 1/4 mile off main lake. Big Hollow is a no wake cove on the Southeast side of the lake. Saddle Island is at the entrance to Big Hollow Cove. Sweet Water Hollow & Serenity Point are to the northeast of Big Hollow. Johnson Hollow & Goat Island are to the west of Big Hollow. Drowning Creek is further west & the closest major cove. High quality luxurious 400 - 475 thread count percale sheets. Front Loading Washer - requires HE detergent. High Speed Internet offered through the Bolt system. 2 sets of turkish towels provided for each registered guest. 2 sets of kitchen towels & dish clothes. Guests need to supply their own beach towels. 5 cup Coffee Maker and Single serving Coffee Maker available along with complimentary coffee pods, sugar & sugar substitute in packets. Child's highchair available upon request. Bolt TV Service with all major stations that are available by cable or satellite. Private covered porch facing the water. complimentary use of a Canoe. Complimentary use of a paddle boat - Spring, Summer & Fall. Water Floats available Memorial Day through Labor Day. Swimming and fishing off the 16 x 36 swim dock. Paddle Boat, Canoe and Floats available for our guests to use while staying with us. Whole house water filter system. Board games. We are already planning to come back! This was the perfect place for a romantic weekend. Everything was perfect! Fantastic getaway! We enjoyed the peace and quiet. The scenic view was breathtaking. Presents a serene environment. We had our children, ages 2 & 5, and they enjoyed as much as we did. They really liked trying to fish off the dock. This property is amazing! They always say location is everything, and this property has it!! Linda and Bob have put a great deal of heart and planning into this property and it shows. The cottage is beautiful both inside and out. And every detail has been carefully planned. The cove that the property sits on is perfect for a get away. We brought our boat and the hosts provided a covered slip to park in. We never even had to leave the cove to fish. Hard to say what feature was our favorite between the fireplace, the beautiful view from the huge deck, the softest sheets ever, the covered dock slip, the perfect cove for fishing, the homemade chocolate chip cookies waiting on the table for us, or the friendly and accommodating hosts. I was in heaven the instant I opened the cottage door upon arrival and Linda had beautiful spa music playing softly on Pandora through the TV and it smelled WONDERFUL!! The attention to even the smallest detail was greatly appreciated by us. Very peaceful and scenic property. Excellent attention to detail. Complimentary use of a paddleboat, canoe & floats along with life jackets while staying with us Fishing and swimming off the dock. Rates are subject to change without notice. $10/person/night charge over 2 people. Maximum occupancy: 4 people. An occupant is defined as a person, adult or child over the age of (1) one year old. Check in: 3 p.m. Check out: 12 noon. Refund Policy: If you need to cancel, We will refund the amount of your rental fee that can be replaced after the rental time has passed. Security Deposit will be returned immediately upon cancellation.